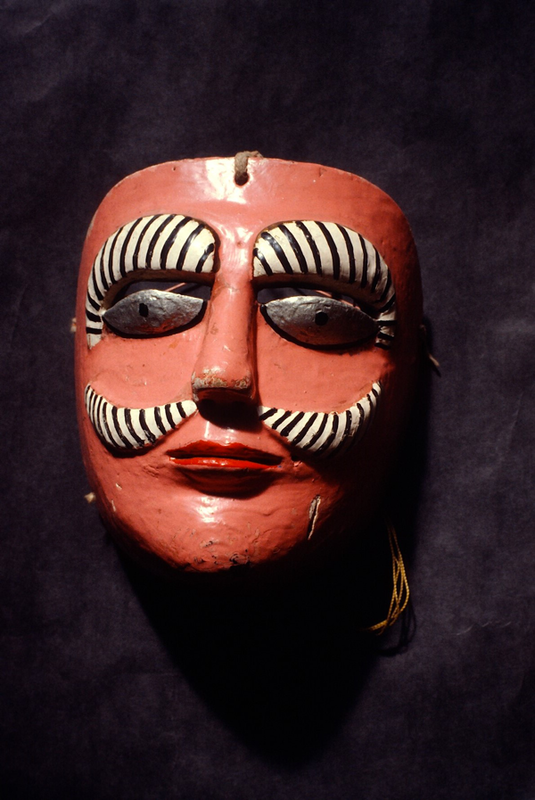 This is the second in a series of posts that are based on interesting and important masks from the James and Jane Urmston collection of Mexican dance masks. 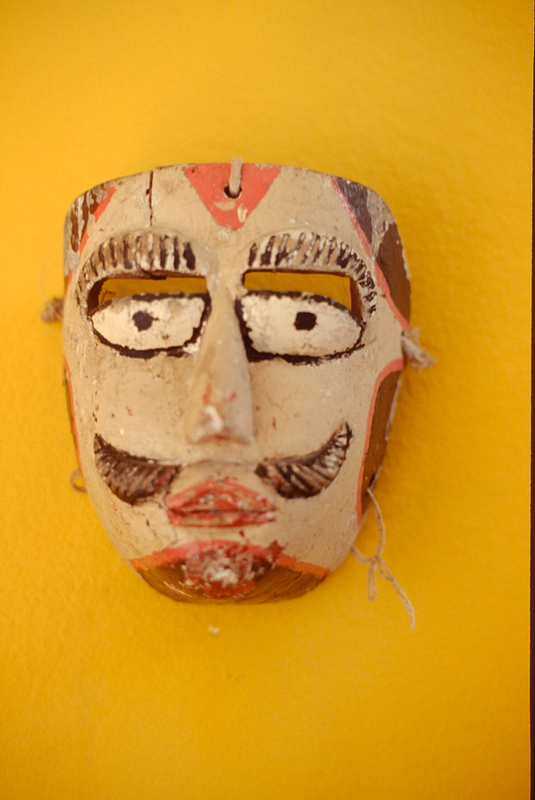 I am using this collection as a springboard for exploration of Mexican mask traditions. Today’s masks led me to the town of Xico, Veracruz. The Urmstons are in the process of selling their collection. Because the collection is actively for sale, I can not guarantee that a particular mask will remain unsold by the time it appears on this site, although many in today’s post are available at this writing.You are advised to act promptly to pursue any mask that does interest you. Note that I have no commercial interest in these sales; I am simply relishing the opportunity to share this collection with interested collectors, whether to purchase or simply to learn from. You may contact the Urmstons at urmston@verizon.net. 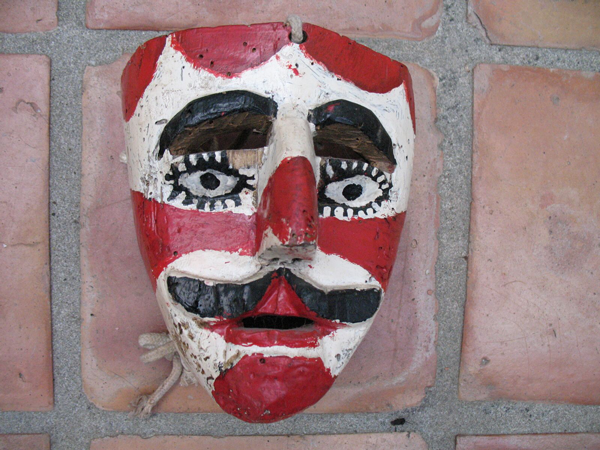 For many years I have been aware of masks from Veracruz that are painted with distinctive red and white designs, in many variations. Little seemed available in published books to explain these masks, but recent You Tube™ videos provide a great deal of information. 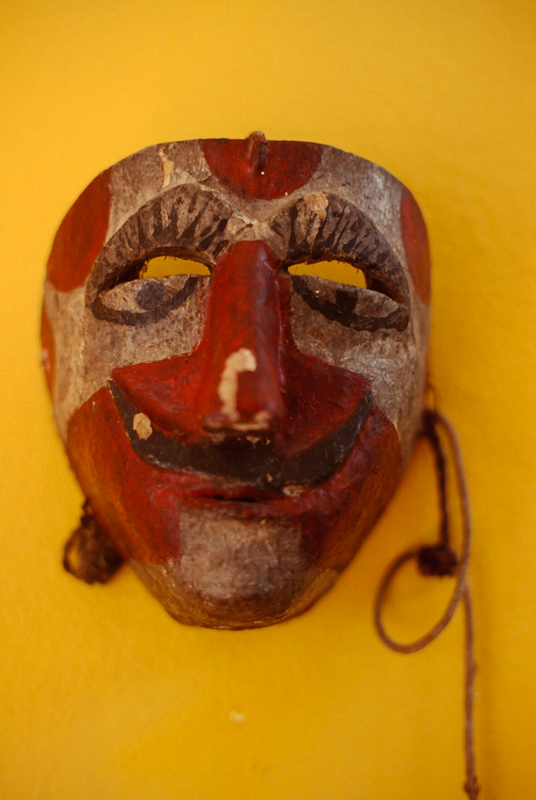 Here is one of these red and white masks, from the Urmston collection. I confess that I always imagined that such masks were worn by Payasos (clowns), but the Urmstons informed me that these are Santiago masks, and this was confirmed by recent videos. These videos require explanation. The Santiago dancers perform within the dance of the Tocotines, a conquest dance that apparently pits Hernán Cortéz and the Santiagos against the Tocotines, who are said to represent Indians. The latter are not masked, but wear elaborate feathered headdresses. There is a corps of Payasos—dancers wearing masks and costumes of circus clowns,who appear to be part of the dance. Here is a video from Xico that is titled the “Danza de Los Santiagos.” There are at least three Santiagos dancers, wearing pie-pan shaped hats, and one of them (only seen near the end of the video) has a pink face while at least two are wearing these red and white masks. In fact, the pink faced Santiago is wearing a clown mask typical of those from Zozocolco de Hidalgo, Veracruz, a Sierra de Puebla town that was featured in my book, Mexican Masks and Puppets; here it is in a dance 100 miles to the North of its usual setting. All three wear scarves with the image of the Virgin of Guadalupe and her image also appears on their hats. They steadily dance in the midst of the clowns. 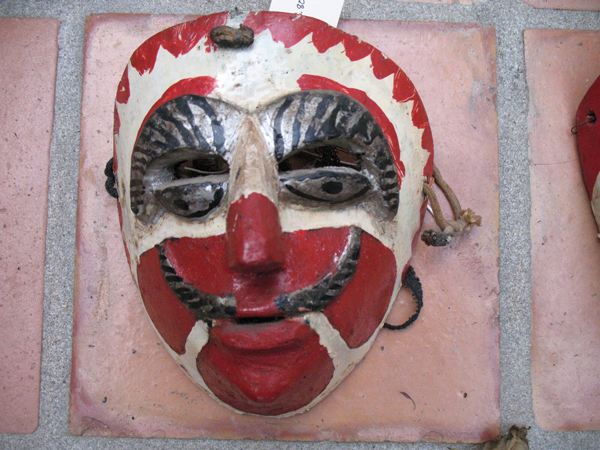 Here is another one of these red and white Santiago masks from the Urmston collection. And here is a pink one. Another video follows, titled—”Danza de Tocotines de Xico. Segundo mensaje de la Malinche” (second appearance of Malinche). One of the Tocotines dancers wears a skirt, and dances with one of the Santiagos, while another watches. Both of those Santiagos wear white-faced masks. 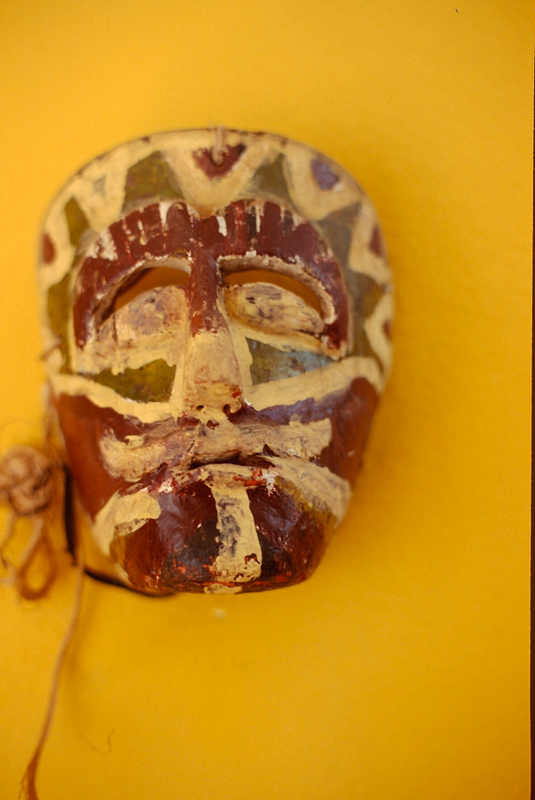 Here are two white-faced Santiagos masks, also from the Urmston collection. It would seem that no two of these masks are the same, and I like them all. 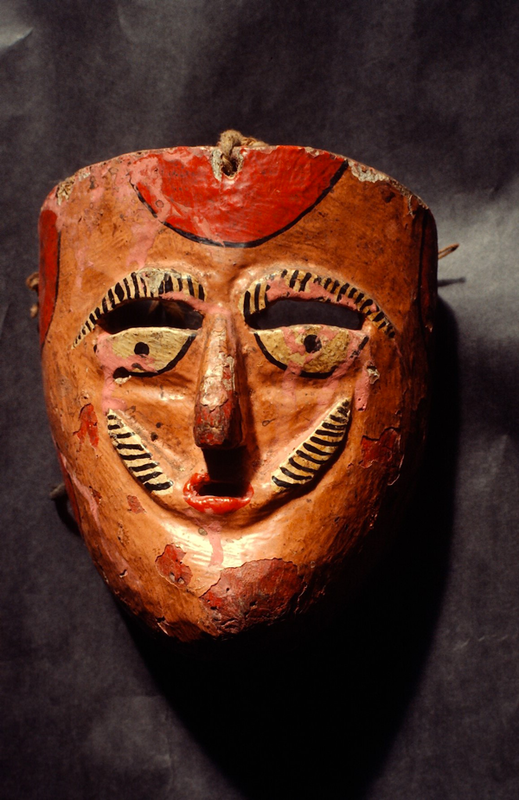 What all of these masks have in common are relief-carved brows and mustaches. 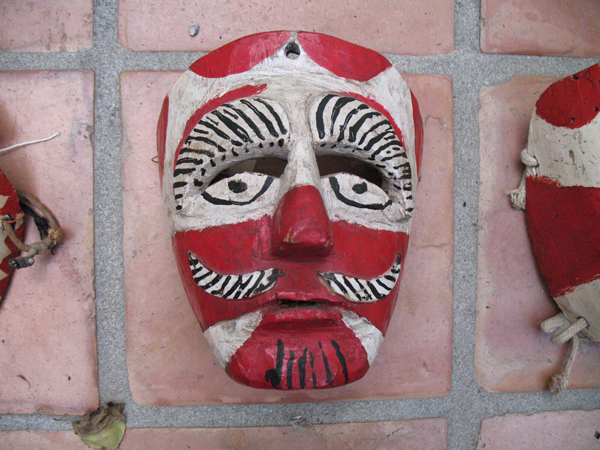 Here is another of the red and white Santiagos masks. In the next video—el Son de Baston (Song of the Cane)—we discover that Hernán Cortéz is also a character in this dance. There are three Santiagos with white faced masks; two dance around Malinche with Cortéz. This is a conquest dance, depicting how Cortéz, allied with his Indian consort and interpreter, Malinche, was able to defeat the Aztecs. Here are a few more of the red and white masks. This one has been very crudely repainted. This one appears to have its original paint, which is quite worn. During a fiesta in Xico there is one more character—El Torito. This refers to a large framework of reeds surrounding a bull; this carries a generous display of fireworks. And here is one last Santiago mask. 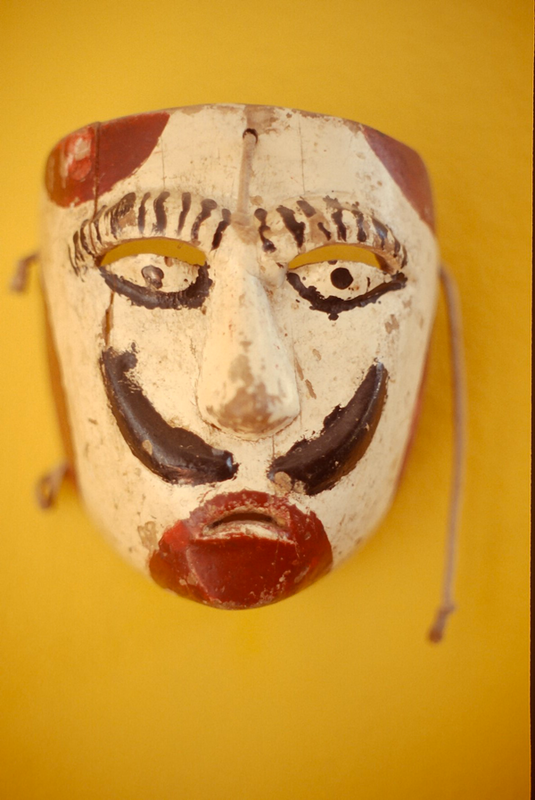 I hope that you have enjoyed this review of the masks used in the Tocotines dance of Xico, Veracruz. Next week I will discuss the so called Danza de Moros y Cristianos of Naolinco, Veracruz, which is actually a Santiago dance that is much like the Danza de los Santiagueros in the Sierra de Puebla, South of Naolinco.